This wonderful organic argan and kale hand cream repairs and hydrates your skin for the day ahead. Rich in vitamin E argan oil, bioactives, essential vitamins and nourishing organic oils which protect the skins elasticity, reduce the appearance of wrinkles and reduce inflammation. Sensitive and dry hands will be left hands will be left refreshed and moisturised. • Kale extract improves skin elasticity, reduces redness and lightens dark spots. • Argan oil hydrates the skin with essential vitamin E while reducing the breakdown of collagen. Aqua, Glycerine**, Arganic spinosa kernel oil*, Helianthus annuus flower extract*, Simmondsia chinensis (Jojoba) seed oil, Cetearyl alcohol, Glyceryl stearate, Brassica oleracea acephala extract*, Crambe abyssinica seed oil, Candelilla/Jojoba/Rice bran polyglyceryl-3 esters, Glyceryl sterate, Cetearyl alcohol, Sodium stearoyl lactylate, Dextran, Caprooyl tetrapeptide-3, Sorbitol, Yeast Extract, Levulinic acid, Sodium levulinate, Glyceryl caprylate, Glyceryl undecylenate, Xanthan gum, Selaginella lepidophylla extract, Lactobacillus ferment, Aloe barbadensis leaf powder*, Lactobacillus/Punica granatum fruit ferment extract, Leuconostoc/Radish root ferment filtrate, Tocopherol, Sodium ascorbyl phosphate, Boswellia Neglecta (Frankincense)*, Algin, Alginic Acid, Hyaluronic acid, Cetearyl glucoside, Bisabolol, Zingiber officinale (Ginger) root extract, Citrus aurantium amara(Neroli) oil*, Commiphora myrrha (Myrrh) oil, Citral, Farnesol, Geraniol, Limonene, Linalool. *Certified Organic. **Organic Origin. From essential oils. 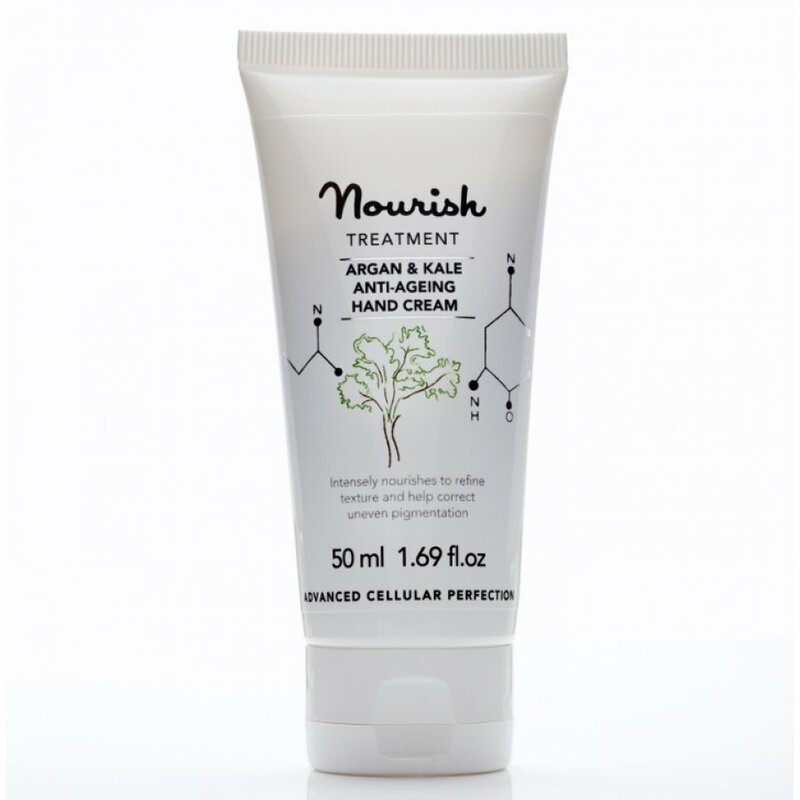 The Nourish London Argan and Kale Hand Cream product ethics are indicated below. To learn more about these product ethics and to see related products, follow the links below. 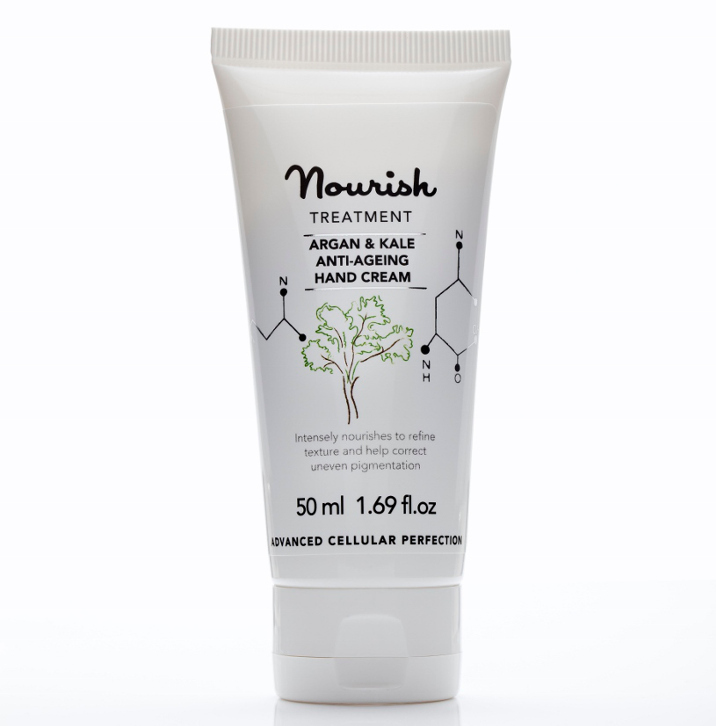 There are currently no questions to display about Nourish London Argan and Kale Hand Cream.